Somehow managing to evade the barriers put in place to deny access to the hordes of students around the school, we were deemed worthy of entry and were greeted by an enthusiastic Mr Dominic Chua (Head/Editorial and Alumni Relations), who was to be our trustworthy guide throughout this eye-opening journey. 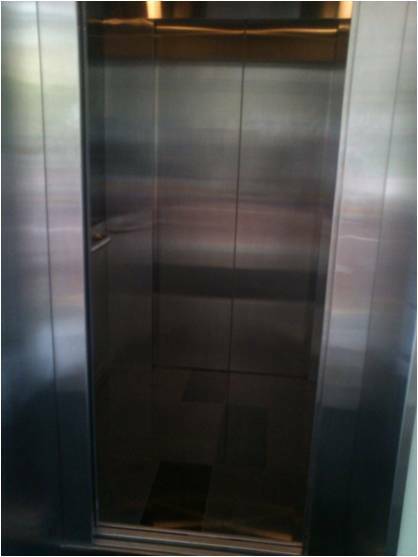 As we exited the lift, we saw an office with the door ajar. Guess whose office it was? 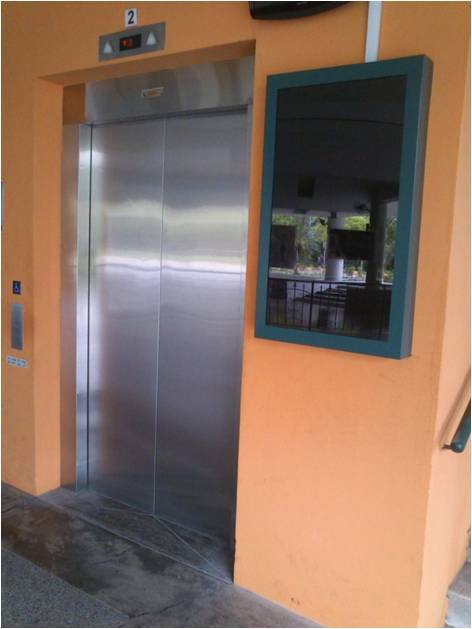 Yes, that’s right, it belonged to our very own principal, Mrs Lim Lai Cheng. Right outside the office, there was a desk occupied by a Malay lady introduced to us by Mr Chua as Mdm Norshida (Executive Secretary to the Principal’s Office). Little did we know that she has been the personal assistant to all of RI’s principals since Mr Eugene Wijeysingha (1986-1994), meaning that she had been working in the school for almost 20-odd years. Well, that’s certainly longer than any of us have lived – we cannot help but marvel at such dedication to her profession. Our first stop on this tour was the RI’s very own “travel agency”. To proceed with the journey, we had to procure the necessary documents. Ms Rachel Ng (Executive, International Office) was on hand to warmly welcome us and host us in her office. She explained that any guest typically had to go through an introduction of the school and a corporate video, followed by a school tour, but we, as special unwanted guests would be spared this “privilege”. Of course, international relations are two-way, so the office also manages and keeps track of outgoing school trips, like those which fall under the ambit of the Year 4 Gap Semester. Having heard this, we thought oh well, how bad can this job be? There aren’t that many visitors, and even then it’s doing the same thing over and over again. As if she reading our minds (maybe in this magical world, she could! ), Ms Ng interjected, “We have had 47 visits since the start of the year…” Wait a minute, just how many is that? “…that amounts to an average of 2 per week”. Now that’s impressive, isn’t it? 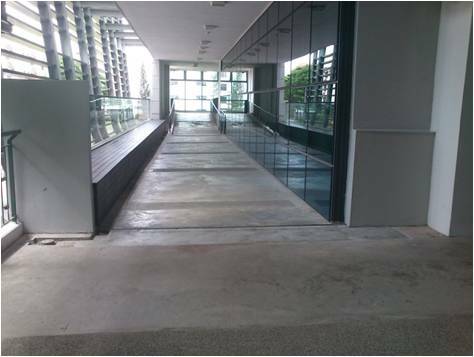 Linkway between the Rajaratnam Block and Block B on the second floor – the Administrative Centre preserves the central spine running through the school! Having procured our visas and passports to the rest of the empire, we came face to face with our next nemesis, the building’s watchdog. By that, we mean financial watchdog, of course. We were whisked into the office of RI’s financial watchdog, Ms Florence Low (Head/Accounting), to get a better understanding of one of the most enviable jobs in the school administration: dealing with money all day long. Who wouldn’t want that? As it turns out, her job isn’t all about dollar bills and living the high life. Instead, it involves careful calculation and decision-making in supporting teachers and students on claims, as well as managing cashflow and investments. In ensuring the financial sustainability of the school, this financial watchdog has to be on her toes at all times in order to effectively safeguard the finances of the school. Having gotten past the first 2 stops without any mishap, Mr Chua wanted to show us his very own office. 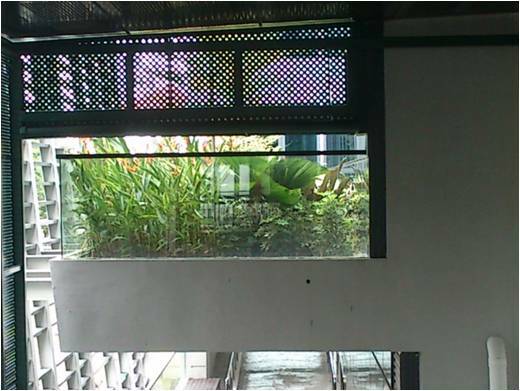 But, on our way there, Mr Chua stopped abruptly at a door beside the lift. He used his magical card to open the heavy teak door and ushered us in. We were unsure what this mysterious room was but as we walked in we caught a glimpse of a sign that simply read “Boardroom”. To our amazement, the room was a huge 40-seater boardroom that was used to house large-scale meetings (including those of the Executive Planning Committee and Raffles Management Committee – the highest organs of the school). It was not wide, but it extended over the length of an Olympic-sized swimming pool (or so we estimated!). Moreover, given its size, there was a surround-sound microphone system which allowed participants from one end to communicate with those on the other end of the table. In addition, we were fascinated when Mr Chua told us that there were electromagnetic strips which charged laptops during meetings, removing the need for obstructive wires or plugs. Genius indeed – certainly a magical prelude to our imminent visit to Mr Chua’s very own Department of Magic. After that special treat, Mr Chua proudly led us to his humble abode, the Communications Department – where you can find your daily dose of magic. With the objectives of fostering internal school spirit (C’mon, I’m sure you can cheer louder than that!) as well as outreach and development (wow, the new banners look amazing! ), the work of this office involves much magic; they routinely create amazing end products out of sheer nothingness and dispel illusions that others might have about the school. 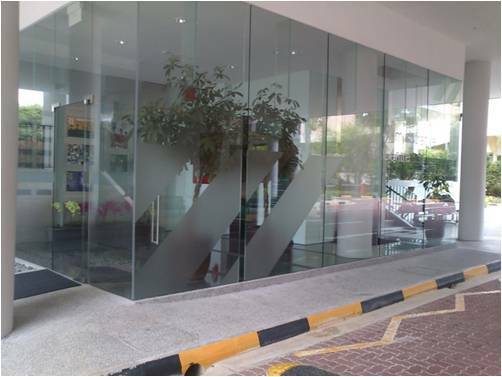 The magical aura of this department is reinforced by the name of their meeting room – The Dreamery. This department aims to conjure up some sensitivity in students for their own heritage by drawing attention to the lesser known aspects of the school. Creativity and excitement brim from this place, making it one of the more enjoyable stops in our journey. 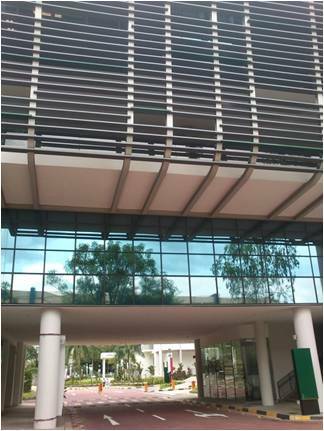 Green space at the front of the administrative centre on the third floor (there is another identical one at the back) – what exactly is its purpose? As we went along, we were getting hungry. Mr Chua, sensing the growling of our stomachs, brought us to have a “feast”. One floor up the lift, we turned the corner and approached a pantry. We were overjoyed, but to our dismay, we walked right past it to an office secluded in a cosy corner. There, we met the cheerful Ms Wee Siew Kheem (Manager/Learning & Development). She gave us a taste of an entire buffet spread of benefits offered by RI’s Gourmet Kitchen – the Human Resource Department. However, our food-filled bubble burst when she explained that the Gourmet Kitchen was merely an analogy and did not churn out any real, edible food. The sky was getting dark and we sought a way out. 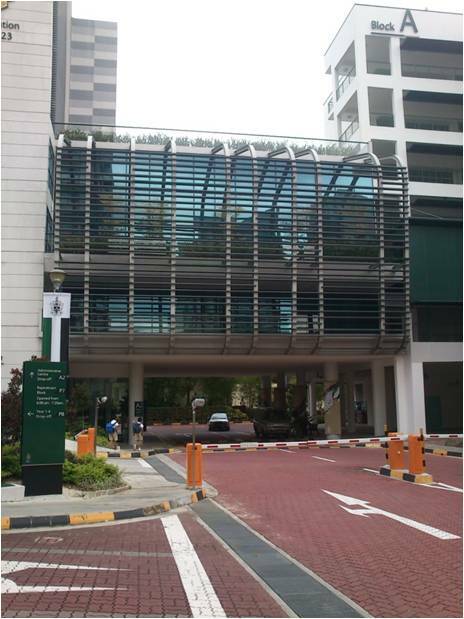 Mr Chua told us to look up the school search engine, which had its headquarters in the Administrative Centre. Ms Lynn Teo (Administrative Manager) was on hand to answer our queries and ably directed us to the exit. 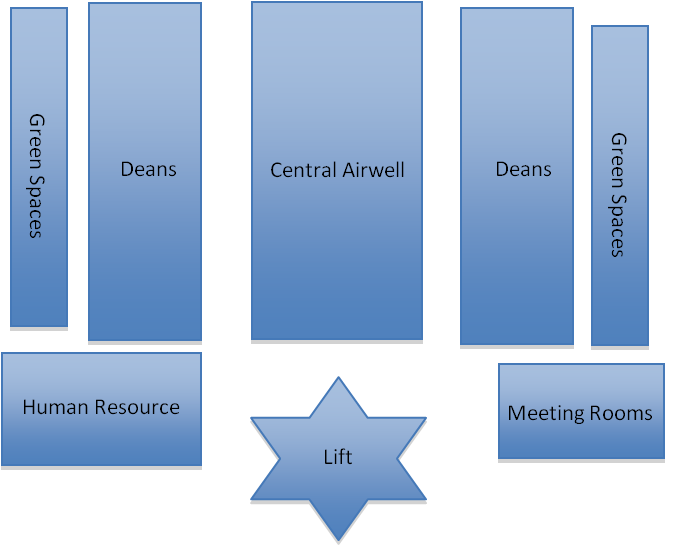 She also told us that there were 3 other “portals” located campus-wide: the 2 General Offices and the Student Affairs Centre to allow more convenient access for students and teachers. Along the way, she mentioned how the AdministrationDepartment was constantly seeking to improve the speed of the “search engine” by standardizing all the available portals with the same information to answer queries readily. More excitingly, they are in the process of introducing TV messaging school-wide to anticipate queries and hence reduce the searches being made. Now, this is certainly going to give Google a run for their money. Evidence of TV messaging being put up around the school? 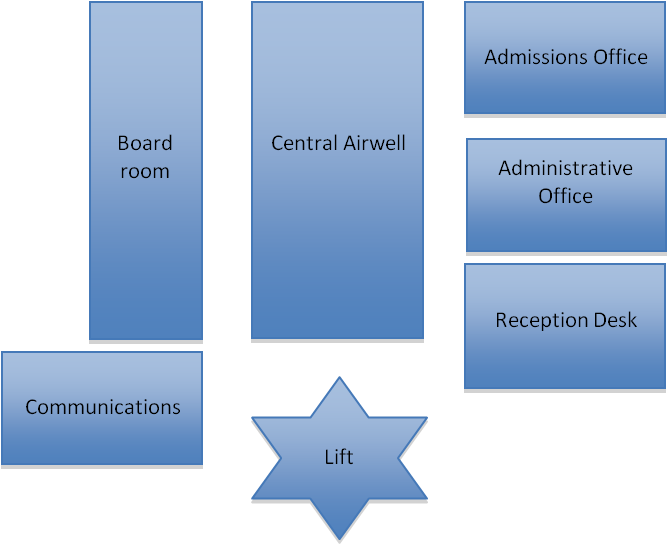 Having gotten our results from the Search Engine, we headed toward the lift, only to find an office along the way. Peeking inside, we met Ms Jane Howe (Admissions Executive Officer), the “gate” mistress, who controls the human traffic entering our school. She came to the office entrance to meet us because documents piled up in the office were classified. This was a busy period for her as the Direct Schools Admissions (DSA) exercise was currently on-going. Other than entering RI at Year 1, there are 2 other routes to entry: in Year 3 and Year 5. These entries typically fall into Ms Howe’s domain. “Every year, only about 225 primary school students out of more than 1000 applicants make it through the DSA exercise”. Clearly, our gates need to be guarded closely or we would be swarmed. 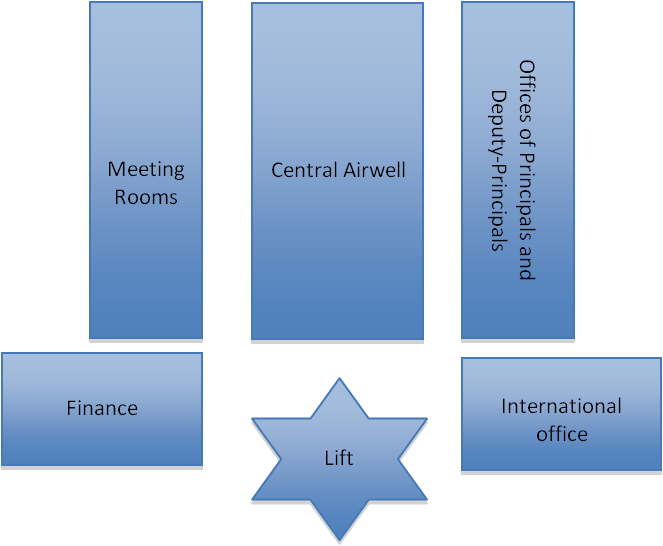 Many people see the Administrative Centre as a highly exclusive compound due to access being restricted to students (visitors are only allowed on the second floor unless otherwise authorized). In truth, however, this is probably necessary to keep out prying eyes and protect classified information. 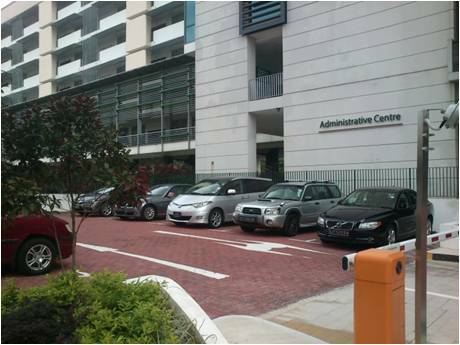 Small carpark for administrative centre staff located at the front of the building – so convenient, as long as boys playing soccer on the Raffles Green do not kick a ball into your windscreen! This building certainly looked every inch of the supposedly exorbitant amount of money that was spent on it (rumour has it that it cost $10 million to build – but we are assured that this is untrue), with top of the line technology in almost every corner as well as comfortable office space for the staff. This has been a bone of contention, as students grumble that this money could have come at a cost of other aspects of the school, for instance, CCA expenditure. However, upon clarification, we discovered that the money spent on this building (undisclosed) was entirely funded by the school’s Infrastructure budget. This means that there was a specific amount of money already put aside for this purpose, ensuring that no other aspect of the school’s expenditure was compromised as a result. With that, our journey finally came to an end. It was time to go back to reality. With a final flourish, Mr Chua, the school’s resident magician, waved us off. This unexpected yet eventful journey opened our eyes to the ‘secret’ on-goings within the Administrative Centre. Contrary to its cold and unwelcoming external appearance, the staff housed in this building exuded such warmth and love for their jobs and the school that it was a wonder that the icy exterior of the building did not simply melt away. Back view of the administrative centre! Raffles Press would like to record our thanks to Mr Dominic Chua (Head/Editorial & Alumni Relations) for taking our correspondents on a tour of the Administrative Centre, as well as to all corporate services staff who were interviewed for this article.